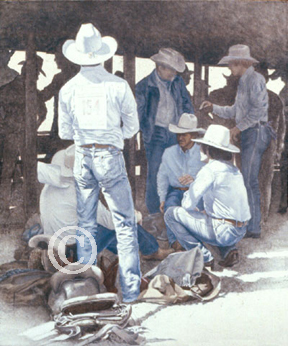 "Behind the chutes in the 'bull pen' cowboys gather to make last-minute adjustments to their riggings, grab a few minutes of sleep, talk about their 'draw', or just catch up with friends on the circuit. The subject of this painting seems to be quite anxious about events in the arena so initially I titled this piece 'First Competition'. But after living with the print for a while the title morphed to, appropriately . . .'Sweet Cheeks'. "